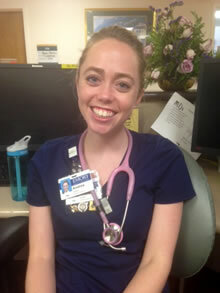 In celebration of National Nurses Week, Emory Saint Joseph's hospital introduces Andrea Greene. How long have you worked at Emory Saint Joseph’s? I decided to become a nurse when I was in the hospital as a child. I thought the nurses were the most amazing people I had ever met, and I wanted to be just like them. I love nursing because I have a very nurturing personality and it lets me express that. Because we see people throughout the recovery and multiple surgeries we are able to form unique bonds with patients on our unit. Each one is different and very special. I am currently a floor nurse on 3 South precepting a new graduate nurse.